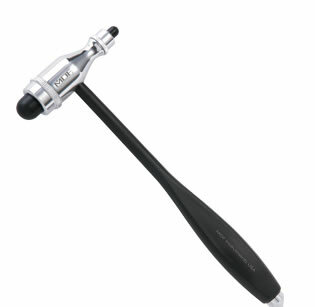 The MDF® Trömner Hammer > Light > HDP Handle (aka Tromner or Troemner) is a versatile 4-in-1 dual mallet-type reflex hammer designed for eliciting myotatic and cutaneous responses in adult and pediatric patients. The ergonomic HDP handle lends the hammer a lighter weight while providing the user with greater control during percussion. This updated design is based on the classic reflex hammer invented by Ernst L.O. Trömner, MD, a director of the Neurological Hospital at St. Georg and professor at the University of Hamburg. The balance-weighted chrome-plated zinc-alloy head is outfitted with large and small mallets constructed of soft silicone for precise tendon percussion. The ergonomic lightweight HDP handle is precisely balanced for increased control of percussion force for eliciting myotatic reflexes.